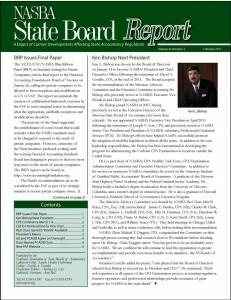 An independent review of the Washington State Board of Accountancy’s policies and procedures was completed on August 11 and resulted in the conclusion that the Board “operates exceptionally well and in accordance with all applicable laws.” The review was done by Zwillinger Greek Zwillinger & Knecht, PC, of Phoenix, AZ. The performance review project looked at the Board’s policies and procedures for public record keeping, the evaluation of compliance by public accountants with accounting procedures and ethical rules, and the investigation and disposition of complaints. A second phase of the project will have the consulting firm work with the Washington Department of Licensing to evaluate the efficacy, economy and accountability of merging the Accountancy Board into the Department of Licensing, as mandated by the 2010 legislature. Rick Sweeney, the Board’s Executive Director, explained the project goes back to a case brought against the Board in 2004 by D. Edson Clark, which was finally resolved by agreement on November 18, 2009. The Board had to pay out $294,000 in consultants’ fees to settle the matter. The independent study was called for by the legislature to provide the Board with best practices for it operations and to minimize its exposure to potential claims of unfairness or bias. Among the recommendations made by the consultants were: development of a comprehensive records inventory system, use of an e-mail management software program and electronic imaging of certain records: perform a legal review of current procedures in response to public records requests; replace the Quality Assurance Review Program with mandatory peer review; establish a subcommittee of licensees to oversee the investigation process; and involve the assistant attorney general prosecutor in earlier stages of those matters that are complex. Executive Director Sweeney reported the Board has started to implement the recommendations, including using administrative court judges more frequently in their disciplinary cases.